NSW Greens MP, Dawn Walker at Gibberagee State Forest - photo supplied. Repeated failures to act on recovery plans, Failure to Save Habitat, Culling Permits Issued 'Over the Phone' and Forestry Industry Exemptions from EPBC Act are driving Australia's Faunal Extinction Crisis according to many who have made a submission to the Senate's inquiry. Repeated failures to act on recovery plans was a common issue. Not only that, recovery plans are outdated if they do get close to being implemented. At state levels no action is being taken, despite 'plans' being in place. For example; The Tasmanian Natural Heritage Strategy was finalised in 2013, but never implemented. A review planned for 2018 never happened. Likewise the Tasmanian Threatened Species Strategy was completed in 2000 but was also never implemented. Conservationists, researchers and community groups are currently expressing their concern at a lack of a funding and long-term support for endangered species throughout Australia in submissions to the senate inquiry into our ongoing and growing faunal extinction crisis. Researchers being forced to compete with each other for funding to help protect threatened species. Locally the focus is loading the work onto volunteers with very little support either financially (many raising their own funds to do the work) or are undermined by ever increasing State laws that work against the federal EPBC. Many believed all levels of government and departments needed to work together to guarantee no further extinctions. Jess Feelhely, of the Law Council of Australia stated exemptions for various industries under the EPBC Act made it difficult to take a holistic approach to conservation. “Any forestry activity undertaken under a Regional Forest Agreement—which in Tasmania is all forestry activity—is exempt from the operation of the EPBC Act,” she said. In 2018 the Tasmanian Government decided to change the planning laws, rezoning virtually the whole of King Island, apart from the State Reserves, as Agricultural Land that allows each landholder to clear 40 hectares per year. The island has now lost 70% of its vegetation and the efforts of volunteers to re-vegetate and provide habitat for the King Island Brown Thornbill	King Island Scrubtit; Australian bird taxa that experts have found are 1st and 3rd on the list of Australian birds most likely to become extinct in the next 20 years, may be pointless. In Tasmania no critical habitat has been declared. Additionally, state culling laws for some species already impacted by disease, with no monitoring, are causing the collapse of some populations - such as the Tasmanian wombat. In Kelso, a land owner in recent years shot dozens and dozens of wombats even though there was no crop or livestock on the land (Police were contacted by locals after shots were heard at night and deceased wombats were seen on the property). Governments have very little control over how many wombats are actually being shot, and the conditions are too lax i.e. there are often no inspections to see if there was a legitimate need for a cull permit, and the land manager, as in the case above, was warned that authorities were on their way, so was able to hide all evidence prior to the inspection. Each permit issued seems to be open ended, with up to 50 wombats able to be culled, no time restrictions and no apparent follow up to count carcasses (this is based on anecdotal reports). Note: ‘Stop the Cull’ Change.org online petition by Wombat Warriors Tasmania presented 37, 000 signatures to State Parliament in 2017. Subsequently, the State Government moved to reduce the cull permits issued. However, one farmer that contacted WRT told us how when dealing with DPIPWE to get advice on how to relocate wombats from under his house to another part of his property, he was told that he could apply on the phone for a cull permit. Add to that wombat crisis the February 18th announcement by Federal Environment Melissa Price to move the EPBC consultation on the Bass Strait Island wombat from the Vulnerable Category to Not Listed, as the only population and place it still exists on Bass Strait islands (Flinders) it is deemed not threatened, without any provisions in place under the EPBC to repopulate where it has been made extinct on those islands with those in the one place they still are, indicates not implementing recovery plans is extended into not implementing restoration, once discovered. In Queensland the same has been found - that state government has no overarching conservation strategy to save its native species compounded by a lack of funding, planning and management of threatened wildlife. Although that state government passed legislation in May 2018 to prevent the clearing of high-value regrowth vegetation on freehold and Indigenous land based on an election commitment, clearing koala habitat to build a mine, siphoning off water for a mine, polluting whole communities for CSG is still allowed. There are currently 955 species threatened with extinction in Queensland, the second-highest number of listings in the country, and that 25% of at-risk birds, 15% of at-risk mammals, 23% of at-risk fish, and 50% of at-risk frogs have all or some of their habitat in the state. Saving Habitat as a driver of saving individual species needs to be prioritised according to the majority of scientists. In New South Wales what is happening elsewhere is also seen to be occurring here. In NSW only 9% of the existing vegetation is considered to be in close to natural condition. Up-to-date data for NSW was not available when the Commonwealth State of the Environment report was prepared. It has since been released, and shows that land clearing rates in NSW increased 800% over three years from 2013-14 to 2015-1616. 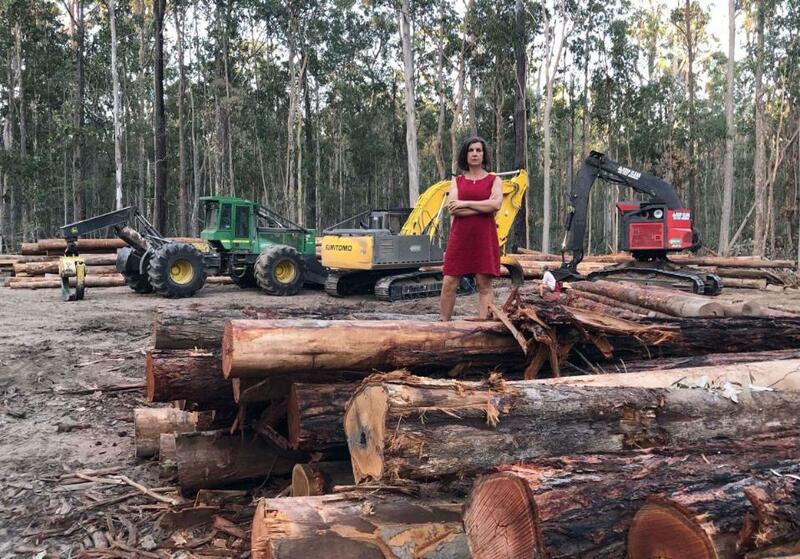 Since the release of the 2016 State of the Environment report, NSW has also weakened its land clearing laws, and it is anticipated that land clearing rates will continue to increase in NSW under these new laws. No data has yet been released under the new laws. However, analysis undertaken by NCC and WWF shows that land clearing rates have almost tripled in the north of the State. The most recent NSW State of the Environment report shows 999 flora and faunal species threatened with extinction in NSW. At state and federal level the signing of agreements to keep culling trees and habitat was extended in New South Wales for another 20 years via NSW Regional Forest Agreements on November 30th 2018 despite those who did bother to make a submission pointing out there were little if any restrictions or requirements to avoid endangered species (many conservation and community groups did not make a 'have your say' submission as the documents read as though the RFA 20 year extension and its terms/scope was already a fait accompli). The view of those who expressed anger at the RFA's consult seems more credible when NSW Greens MP, Dawn Walker was fined for protesting against a logging operation that was caught destroying koala habitat in Gibberagee State Forest, south of Lismore in February and the total disregard to residents finding a listed as vulnerable Masked Owl in Corunna Forest and its home being culled too anyway. The 2016 NSW Climate Change Policy Framework, achieving net zero emissions by 2050 and making NSW being more resilient to a changing climate, has failed to have any meaningful application to NSW mine approvals and even has been reallocated according to a Sydney Morning Herald report published this week. The federal government's 20 million trees program has not been heard much of lately either, all meant to be planted by 2020 - or just one tree planted by 20 million of us. Keeping those taller trees already holding all that biodiversity together would have given the newbie 20 mill a good start. Considering India was reported as having planted 66 million trees in just 12 hours in 2017 (India has vowed to increase their forest coverage to just over 95 million hectares by 2030 for their 1.339 billion population), Australia's efforts to date - failure to implement, failure to act, failure to save habitat, failure to stop culls, disease, failure to quickly facilitate saving those on the precipice, failure to stop loggers from taking down known critical habitat for critically endangered species, failure to recognise that wanting to save the environment and all in it doesn't make you a greenie or a bluie or in a 'lunatic fringe' - are totalling up to an end failure the place on the planet losing the most species to extinction can ill afford. Locally there has been one green spark this week in MP for Pittwater Rob Stokes announcing his government will work to secure that patch of littoral forest atop Newport and thereby all that lives in it if reelected - saving habitat is clearly the way to go. The Government is moving to implement detailed recovery plans to assist two species listed on the Threatened Species Strategy, including the Brush-tailed Rabbit-rat and the Central Rock rat, and the ecological communities of the Littoral Rainforest and Coastal Vine Thickets of Eastern Australia and the Clay Pans of the Swan Coastal Plain in WA. It was also necessary last week for me to transfer the Spectacled Flying-fox from the Vulnerable to the Endangered category of the national threatened species list, based on the robust science provided by the CSIRO-led monitoring program. The uplisting of the Spectacled Flying-fox reflects the Government's heightened concern for its future, given that the population has halved in the past decade, and was heavily impacted by a recent heat stress event in north Queensland. It is important that we work with the Queensland Government and the broader community to conserve this species. The listing of species is critical in coordinating recovery efforts across all States and Territories and builds on the $425 million the Government has invested in protecting and preserving Australia's most threatened species since coming to office. The Brush-tailed Rabbit-rat is found in monsoonal areas of northern Australia, while the Central Rock rat is located primarily in the Northern Territory. Listing ensures a planned and logical framework to coordinate conservation efforts across Government and key interest groups and is based on detailed scientific investigation. Based on the Committee's expert advice, I have also decided to refine the listing for ten threatened species. Any uplisting is concerning to me, but I have tremendous faith in the science and planning that goes into monitoring and supporting our environment, its flora and fauna, and in the strength of these plans in protecting our native species. The new science included in the listing assessments and conservation advices for these species will help us to improve our recovery efforts, further align those efforts with state and territory governments, and ensure we are getting maximum benefits for the concerned species. More detail on the amended listings can be found in the table below. On 26 November 2018, the Senate granted an extension of time to report until 29 May 2019. The Swift Parrot is in imminent danger of extinction. With fewer than 2000 birds left in the wild, the Swift Parrot was urgently uplisted to Critically Endangered last year. It is one step away from extinction. Yet the Tasmanian Government owned Sustainable Timber Tasmania has just logged a large tract of eucalypt forest at Tyler’s Hill, near Dover, in the South-east Tasmania Key Biodiversity Area – an area long known to provide critical breeding habitat for the species. To make matters worse, the logging has coincided with the Swift Parrot breeding season. Dr Dejan Stojanovic, a conservation biologist at the Australian National University, said he and his research team had been monitoring the habitat at Tyler's Hill for a decade. Last week he visited the site to plan for the installation of predator-proof nest boxes, used to protect the birds from sugar gliders. Upon arrival he found the area had been felled. “It was pretty shocking, to be honest. We’ve been monitoring this site for about a ­decade now and we’ve known for a long time that it’s critical swift parrot habitat. On arrival a whole patch of bush where these birds have nested for over 10 years of our monitoring was just gone.” Dr. Stojanovic said. Forestry Minister Guy ­Barnett said the coupe logged was within the production forest zone, which the Wilderness Society and the Greens had signed off on as being available for harvesting under the ­dismantled forestry peace deal, the Tasmanian Mercury reports. BirdLife Australia has condemned such a flagrant disregard for one of the nation’s most threatened birds. Our national nature laws are clearly broken when short term economic interests trump the future of a species. “When Sustainable Timber Tasmania is legally allowed to push a species towards the extinction cliff, it’s abundantly clear that Australia desperately needs new nature laws that will actually protect nature,” continued Mr Sherwin. BirdLife Australia calls on the Tasmanian and Federal Governments to take urgent action to ensure the logging of further Swift Parrot habitat stops immediately. In 2016 the government entity failed to achieve Forestry Stewardship Council (FSC) certification on a number of points, including threatened species management. FSC advised the company it needed to, among other things, identify swift parrot nesting habitat before its forests could be labelled "environmentally, economically and socially responsible". In a statement this week the Tasmanian Environment Minister Elise Archer said her department was working closely with the Forest Practices Authority to ensure appropriate management of swift parrot habitat. “Ongoing discussions with Sustainable Timber Tasmania are aimed at developing a strategic landscape approach to the management of the ­species,” she said. Dr Stojanovic said protecting the bird’s nesting areas “wasn’t really that hard”. “Don’t cut down mature trees in areas where we know swift parrots need them,” he said. The fact the logging was done legally was an “indictment of the quality of the law”.